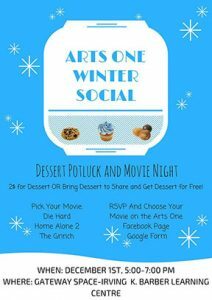 A gentle reminder about your Arts One Winter Social. The tally’s are in, the winning votes for the Winter Social Movie go to: Die Hard. (the classic starring Bruce Willis). It’s a dessert-pot-luck so you’re encouraged to bring a dessert to share but if you’re not able to, bring two dollars and you can still enjoy the delish treats while allowing the student reps to purchase something on your behalf.